On the most relevant benchmark – sign-ups for private coverage through so-called Qualified Health Plans – 2019 enrollment through the New York State of Health was up about 272,000, an increase of 19,000 or 7 percent compared to this time last year. This contrasts with a 4 percent decline tallied by the 39 states using HealthCare.gov, the federal insurance exchange. 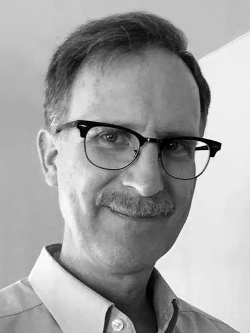 This is likely due in part to the federal exchange’s shorter enrollment window, which ended in mid-December, while New York’s continued to the end of January. Those figures are misleading in at least two ways: First, they combine enrollment numbers for both private plans and government-run programs, such as the Essential Plan, Child Health Plus and Medicaid, which have little or no premiums and allow year-round sign-ups. Second, they omit the large but shrinking number of Medicaid sign-ups that are not processed by the New York State of Health. If all of Medicaid is included, the overall enrollment increase since this time last year is about 66,000 or 1 percent. The fuller picture is shown in the table and chart below. Qualified Health Plans are what many people think of as “Obamacare” plans. They’re offered by private insurance companies and, when purchased through the exchange, come with tax subsidies that reduce the premium cost for lower-income consumers. As mentioned before, sign-ups for these plans rose by about 7 percent. Also up by 7 percent is enrollment in the Essential Plan, an optional benefit under the Affordable Care Act offered only by New York and Minnesota. To be eligible, enrollees must have incomes below 200 percent of the poverty level – or below $24,980 for an individual or $51,500 for a family of four. Premiums are either $20 a month or nothing. Child Health Plus, a state-federal program that predates the ACA, is also seeing growth. Monday’s press release showed enrollment of almost 418,000 – far higher than the 387,000 tally reflected in the Health Department’s monthly report for January. The press release did not note the disparity or offer an explanation. Also rising – by 322,000 – is the number of people who use the exchange to sign up for Medicaid, the state-federal health plan for the poor and disabled. However, that increase is almost exactly offset by declining Medicaid enrollment off the exchange. 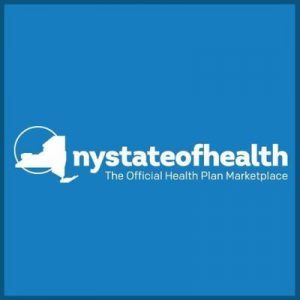 Total enrollment in New York Medicaid has been roughly flat, hovering between 6.1 million and 6.2 million, since 2015. 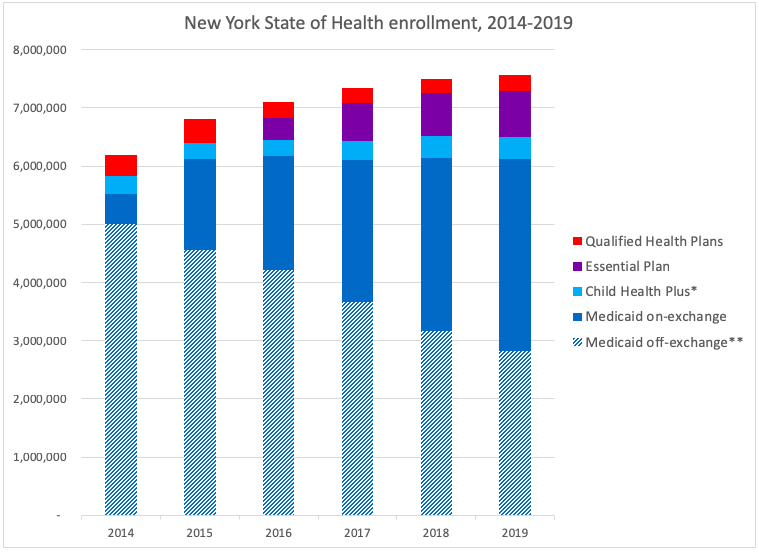 Sources: NYS of Health; *Department of Health; **Empire Center estimates based on Medicaid enrollment data from the Centers for Medicare & Medicaid Services.